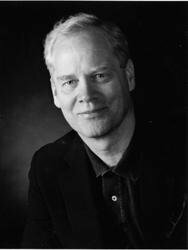 Then one day Dave Packer, a certified loudmouth, bumps into an idea -- a big one that makes him try to keep quiet for a whole day. But what does Dave hear during lunch? A girl, Lynsey Burges, jabbering away. So Dave breaks his silence and lobs an insult. And those words spark a contest: Which team can say the fewest words during two whole days? And it's the boys against the girls. This funny and surprising audiobook is about language and thought, about words unspoken, words spoken in anger, and especially about the power of words spoken in kindness...with or without a bullhorn. 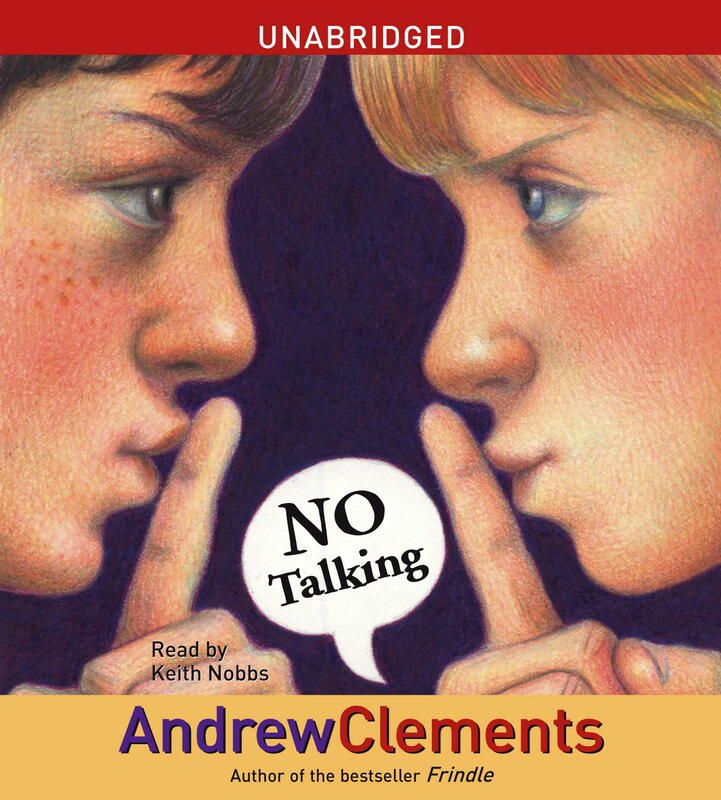 It's Andrew Clements at his best -- thought-provoking, true-to-life, and very entertaining. Who are the "Unshushables"? How do the teachers at Laketon Elementary feel about the "Unshushables"? Have you ever been part of a noisy group? Why do you think this was the case? Who is Gandhi and how does he get Dave Packer into trouble? Who helps turn Dave's experiment into a grade-wide contest? What are the terms of the contest? Who is Mrs. Hiatt? List some of the unusual steps she has taken to try to handle the fifth-grade class. Have her efforts worked? Has she given up? What surprises Mrs. Hiatt at the fifth-grade lunch on the second Tuesday of November? How do Mrs. Marlow, Mrs. Akers, and Mr. Burton each react to the surprise? What challenges do the fifth graders encounter as they get through the first hours of the contest? What loopholes do they find that allow them to make noise? What are the differences between talking and noise? What does Dave decide is the right word for the contest? Why do you think he chooses this word? Would you choose this same word to describe the contest? Why does the author title Chapter 13 "Language Lab"? What experiment does Mr. Burton perform? What is the result of his experiment? What do the kids discover as they try to keep quiet at home? How do their parents react to the silence? How do the kids handle Mrs. Hiatt's "Pledge of Allegiance" trick? Why do they do this? What happens when Mrs. Hiatt demands an end to their contest? What change is happening in the relationships between the fifth graders? Why doesn't Mrs. Escobar mind that the kids have disobeyed Mrs. Hiatt? What happens in her math class? What happens in Science, Social Studies, and Language Arts? How do the kids handle their music class on the second day? How does Mr. Burton feel about Mrs. Hiatt's efforts to stop the fifth-grade contest? What does Mrs. Hiatt do when she finds out that the contest is still going on at lunchtime? How does she confront Dave? How does Dave respond? How does Mrs. Hiatt feel about her actions? Can you understand why she acted the way she did? What happens when she asks Dave to her office? Why is the final chapter entitled "Winners"? Who are the winners in this story? Explain your answer. Go to the library or online to learn more about Gandhi and civil disobedience. Use your research as the basis for a short report about Gandhi and what larger lessons from his life -- beyond silence -- are at play in No Talking. Keep a journal in which you record the noisy and quiet times in your day or week. Include comments, such as how noise affected your mood or actions, and which parts of the day you most enjoyed. Share your observations with friends or classmates. Are their experiences and opinions similar to your own, or different? Interview a teacher or school administrator about his or her job. Include questions about the value of order and quiet, how it is maintained, and when noise is okay. Have students ever taught them something exciting and new? Based on your interview, write an article about this teacher or administrator for your school or classroom newspaper. Explore nonverbal ways people communicate, such as sign language and writing, or through arts such as pantomime, dance or painting. Divide classmates or friends into small groups to create informative posters about these different ways of communicating. Display the posters in your school or community, along with a "guestbook" inviting viewers to write down their reactions to the information. Try one of Mr. Burton's experiments, such as making up a group story with each student offering just three words; spending a class period WRITING ONLY but communicating with at least four other people; or holding a debate, such as the pros and cons of soda machines in the cafeteria, using three-word arguments. Make a "top ten" list of reasons for keeping quiet. Illustrate and post the list in your home or classroom. Or, list the top ten appropriate ways to make noise. In the character of Mrs. Hiatt or Mr. Burton, give a presentation to a group of parents or colleagues, describing the No Talking Contest, its outcome, and how the experience changed your thoughts about teaching and discipline. Write a letter to your teacher explaining why you would like to hold a No Talking Contest in your classroom. Do you think the activity will be easy or difficult? What do you hope to learn? With the approval of parents or teachers, hold a No Talking experiment in your home or classroom. Agree to a set of rules (use rules from the story if desired), decide if this will be a contest, and determine how long it will last. Afterward, write a short essay about the experiment. Did it work? Who were the winners? In the character of Lynsey, write a journal entry explaining why you decided to "even the score" between the boys and girls just before the contest ended. Or, in the character of Dave, write a journal entry explaining whether you would have done the same thing if the situation had been reversed and how you feel about Lynsey's actions. Imagine you were one of the Laketon Elementary fifth graders involved in the No Talking Contest. Write an essay describing the two days from your point-of-view and the most important thing you learned from the contest. Conclude with an explanation of whether you would or would not participate in the contest if it started again tomorrow, and why.